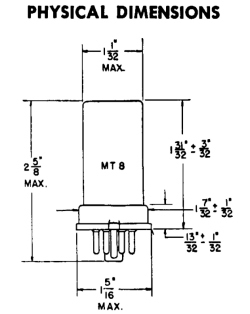 Pentodes were introduced to eliminate the restriction on plate voltage swing of the tetrode, by getting rid of the dip. A new third grid between the screen grid and the plate, the suppressor, was held at cathode potential and repelled secondary electrons back into the plate, as well as making the electron division independent of plate voltage. This made pentodes useful for audio and power amplifiers in general as well as for RF amplifiers. The screen grid, at signal ground, reduced the grid-plate or Miller capacitance to very low values, less than 1 pF, as for tetrodes. The consequent reduction in negative feedback at high frequencies made RF amplification possible without hard-to-adjust neutralizing circuits. Therefore, pentodes were always found as RF and IF amplifiers in radio receivers. These were voltage amplifiers, and of two kinds: sharp cutoff and remote cutoff. The remote cutoff pentode had a control grid of uneven spacing, so that when the bias was large, the transconductance of the tube became small, limiting the gain so that the amplifier would not be overdriven and produce distortion. Typical RF pentodes are the octal 6SJ7 (sharp) and 6SK7 (remote), or the miniature 6AU6 (sharp) and 6BA6 (remote). Usual plate currents were 10 mA or less. It was also found that pentodes, like tetrodes, made excellent voltage amplifiers, because of the increased plate resistance. A pentode acted like a current source instead of a voltage source. This put a premium on high transconductance, which made large gain possible in a single stage. Gains of 40 or 50 are quite practical in a pentode voltage amplifier, in contrast with gains of around 15 for a medium-mu triode amplifier. On the other hand, the gain of a stage now depended sensitively on the load resistance; if this varied with frequency, as for a loudspeaker, so did the gain. This was only a disadvantage in final power amplifiers, of course. Sharp-cutoff pentodes were widely used as audio amplifiers. The circuit for measuring pentode characteristics is shown at the left. 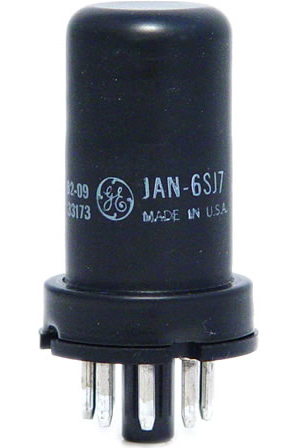 The tube used as the example is the 6SJ7, but any sharp-cutoff pentode will do, such as the miniature 6AU6. It makes things very easy if you have four DMM's for the various measurements. The screen supply can be fixed-voltage. I used 105 V from a VR tube at first, later the all-in-one supply described above, which proved very convenient. The plate supply should be variable, as well as the grid bias. When screen and plate voltages are first applied, the grid bias should be set to some negative value to avoid surprise. The cutoff bias can be estimated at about 1.5 times the screen voltage divided by the screen amplification factor (take as 10 if you do not know it beforehand). Vacuum tubes are much more rugged than transistors, and a momentary oversight will not usually result in disaster. The suppressor grid of a pentode is always connected to the cathode, and is often not even brought outside the envelope, but is connected internally to the cathode. The first thing to do is probably to measure the screen or triode-connection characteristics. To do this, connect the screen and plate together and measure the total current with a single DMM. Set the grid bias, and then measure the total current as a function of voltage over the range available to you. Repeat for several values of the grid bias, so you obtain a family of curves like the plate characteristics of a triode. From these curves, estimate the amplification factor, plate resistance and transconductance, just as for a triode. Now connect the plate and screen to their separate supplies, and run plate characteristics for a fixed screen voltage. In this case, the cathode current will be about constant, and will divide between the screen and plate. Determine the ratio of division at various plate voltages. For the 6SJ7, I found gm = 2.56 mS, which is quite high for this tube. With 75 V on the screen, cutoff was at about -5 V on G1, and the screen resistance rg2 was about 8200Ω. I also found that the screen current is about 0.3 of the plate current, roughly independently of voltage, if the plate and screen are at about the same voltage. The screen takes a rather large proportion of the cathode current in such tubes, but this is not deleterious since the total current is small. The suppressor grid of the 6SJ7 is brought out to a separate pin, and is normally connected to the cathode at the socket. By testing the tube with the suppressor grid connected to the plate, you can see that the suppressor grid is a bit more complicated in action than usually thought. It makes little difference whether the grid is connected to plate or screen, showing that the current intercepted by it is small, and does not affect the results. 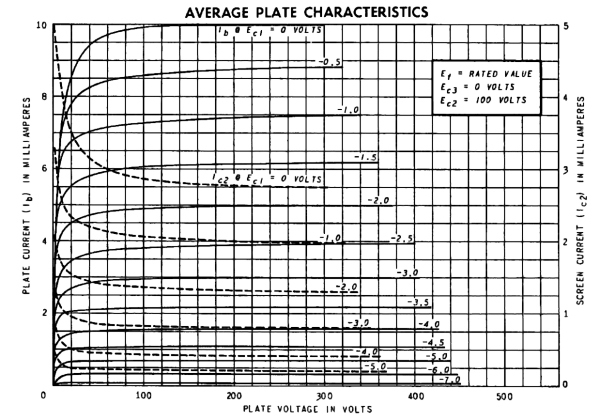 When the plate voltage is higher than the screen voltage, nearly all the current goes to the plate. As the plate voltage is decreased below the screen voltage, the screen current rapidly rises until it is about equal to the plate current. This rapid variation in the plate current would be quite annoying. The suppressor grid, when connected to the cathode, does indeed send secondary electrons back to the plate, but it is evident that it also affects the distribution of the cathode current between plate and screen, and the effect of secondary electrons is not as great as it may seem. With the suppressor grid connected to the cathode, as is the usual case, the plate and screen currents are both practically constant, with the screen taking about 20%. One could use the suppressor grid to change the plate current, and, in fact, this is done in the pentagrid converter, which has a different structure and a special grid for this purpose, as we shall see below. A pentode voltage amplifier using a 6SJ7 is shown at the left. The AC gain of this amplifier is close to gm = 1.6 mS times 68.8k, or -110. It won't be quite this high with a 90V B+, but will still give a lot more gain than the triode amplifier. My 6SJ7 gave a gain of -60 at Vbb = 90 V, and Vp was 27.2 V, showing that the plate current, 0.63 mA, should be reduced a little to raise the plate to about 45 V. The 6SJ7 tested was very close to specifications, despite its age. A good example of the remote-cutoff pentode is the type 39/44, which uses a 5-pin base and a grid cap, so it is interesting to experiment with. You could also use a type 78 with a six-pin socket and grid cap, or the identical 6K7 with an octal base, or the later 6SK7. All these tubes should give equivalent results. 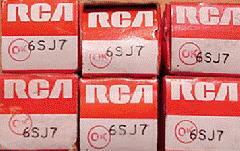 They were very popular for rf and if amplifiers. Their feature, as we have mentioned, is that the transconductance, and so the gain, could be varied by changing the grid bias. The 39/44 has a maximum plate voltage of 250V, and a maximum screen voltage of 90V. The heater is pins 1-5, taking 0.3A at 6.3V. 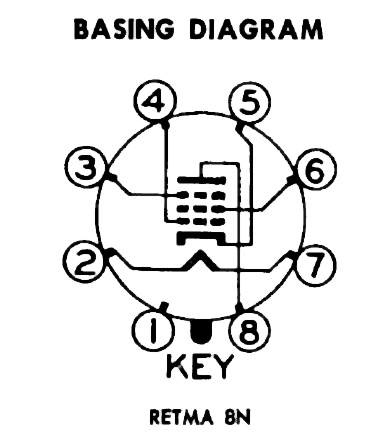 The plate is pin 2, the screen pin 3, the cathode pin 4, and the control grid is connected to the cap on top. In lieu of a proper grid connector, I use a short piece of 3/8" I.D. lucite rod to fasten the grid connection. If you run characteristics of the 39/44, using 90V on the screen, the transfer characteristic looks like the figure at the right. Above about 4 mA plate current, the transconductance is about 1.0 mS, and below about 2 mA plate current, it is about 0.2 mS. It varies smoothly, of course, so the characteristic is curved. This means that there will be distortion for large grid swings, but the tube is not used in this way, like a power pentode would be. I actually found rather linear variation for small and large plate currents. The plate resistance is about 1 MΩ, so the tube is a pretty good current source. In a transistor amplifier, we can change the gain by changing the collector current, since the transconductance is proportional to it. The circuit at the left is closer to the way the tube was used in practice, when the load was usually a tuned IF transformer. In place of the transformer, there is a 10 mH rf choke. The results of the experiment may depend somewhat on what choke is used; this one is a Digi-Key M7103, with a ferrite or powdered iron core. Vary the frequency of the signal source to find the point of maximum gain; in my case, it was at 269 kHz. You will probably be astonished by the gain--I found -318! The phase shift is 180° at maximum gain, so the tube is working into a load of about 320k. Obviously, the 10 mH coil is in parallel resonance at this frequency. If you compare output and input with the scope, the output will lag at a lower frequency, and lead at a higher frequency, as expected, and the resonance has a fairly high Q. The actual coil is more or less equivalent to a 35 pF capacitance in parallel with the 10 mH. Above 269 kHz, it is a capacitor, not an inductor! In a typical Circuits or Electronics course, the 10 mH choke would be just that, and would have an inductive reactance of about 63k at 1 MHz. Woe to the student who would say that it would have a capacitive reactance of 4500 ohms at this frequency, but it would have, all the same! Above 270 kHz, this choke is more like a short circuit than a choke. If you replace the 10 mH choke by a resistive load, you can see how the circuit would be affected. Now there is a voltage drop in the load resistor, so it is limited to about 33k if the plate current is 4.8 mA (obtained by a 510Ω cathode resistor), and the gain to about -33. If you try to overcome this by using a small plate current, say 1.6 mA (cathode resistor 4700Ω), then a larger resistor, say 47k, could be used. However, the gain would now be only -9.4, since the transconductance is so much lower. A remote-cutoff pentode is not suitable for low-plate-current voltage amplifiers--a sharp-cutoff pentode should be used instead, or even a high-mu triode. However, the remote-cutoff pentode is just the thing for reactive or transformer-coupled loads, since these do not reduce the plate voltage. It is very satisfying to be able to compare the behavior and use of remote-cutoff, sharp-cutoff and power pentodes. An RF amplifier using a 6SK7 remote-cutoff pentode is shown at the left. 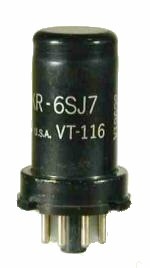 You could also use the miniature 6BD6, which is a little less expensive, or the 6-pin base type 78, the prototype for these tubes. The 6SK7-GT is very well shielded, with a Cgp = 0.005 pF, which makes the Miller effect negligible. Note that the grid bias can be varied. The purpose of this is to show the variable gain of the amplifier. In a radio receiver, the grid bias is supplied by the AVC (automatic volume control) circuit, and is the dc value of the rectified signal at the detector (see below). The gain of this amplifier is near -100 for zero bias, decreasing to -8 at a bias of -12V. Adjust the frequency of the signal generator for maximum output. Since this circuit has only one tuned circuit, there is no problem with alignment. Measure the gain of the circuit as a function of grid bias. The decrease of gain is practically linear up to about -8 V, but then begins to curve over rather than decreasing abruptly to zero. If we assume an ideal linear dependence, then the output signal is limited at the value that gives the cutoff bias. In a practical case, the amplitude of the output varies slowly with the amplitude of the input. If the input signal is weak, we get the full gain of the amplifier. Note that the only components in this circuit, besides the tube, are the two air core transformers. A practical circuit would have some other components, but this circuit shows the principle at its simplest. The sharp-cutoff pentode made the best high-gain audio voltage amplifiers. A circuit with gains of over 100 is shown at the right. 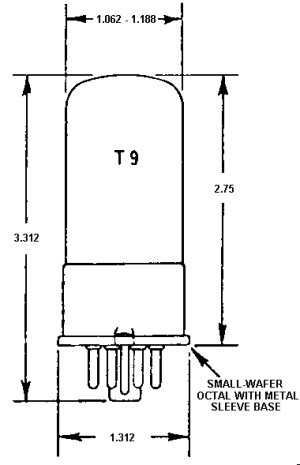 The tube is the type 77, which uses a 6-pin base. The heater is connected to pins 1 and 6, taking 0.3A at 6.3V. I used the 77 for the fun of it, since it is not an expensive tube, the construction is evident, and it harks back to the 1930's. The outer electrode that you see is the external part of the screen grid, not the plate. Peek under it to see the actual plate. The octal 6J7 has the same electrical characteristics (except that the 77's screen voltage is 100V max.). The 6SJ7, which we looked at above, is also very similar. The "S" meant single-ended, since the 6SJ7 does not have a grid cap. Two sets of values for the components are shown for this amplifier. The upper values give a gain of -164, a plate current of 135 μA, a plate voltage of 29V, a screen voltage of 17V, and a grid bias of -0.8V. The lower values give a gain of -117, a plate current of 262 μA, a screen voltage of 20V, and a grid bias of -0.9V. It is necessary to have a low plate current to permit a large plate resistor for high gain, so the screen voltages are quite low. No load is shown for the amplifier, but it would usually be a high-impedance grid. Note that an attenuator is shown at the input. This makes adjusting the signal generator much easier. I noticed a little 60Hz hum on the output, which is not surprising in view of the large gain, and the length of unshielded wire going to the grid cap. When fed a square wave, the amplifier showed a rise time of around 25 μs, and a sag of 1.0V in 4.4 ms when the amplitude was 13.4V peak to peak. These figures agree pretty well with a measurement of the bandwidth by varying the input frequency, which gave 35 Hz to 17 kHz. In this circuit, we use the screen to hold down the plate current so a large plate resistor can be used even with a modest supply voltage, while keeping the plate voltage high enough to allow a reasonable output swing. Even with the reduced transconductance, we can achieve good gains, considerably higher than those possible from a triode.